Monsters and mythical beasts have slowly been taking over my kids' imaginations this past year. All three have really gotten into the Harry Potter, Percy Jackson and Kane Chronicles series -- along with all the creatures that inhabit those worlds. They have turned to the popular Monsterology and Dragonology books for more information about wyverns, hippogriffs, and other amazing beasts. They love the drawings and the details -- and I love anything that gets them to read so voraciously. So I was delighted to hear that Nukotoys is coming up with a new kind of trading card game, based on the Monsterology books. Last week I was part of a group of bloggers who spent the day with Nukotoys executives, learning all about what how this new game is played, and I can't wait to tell you all about it! Each card has all the beautiful, intricate detail that the Monsterology series is famous for. Monsterology fans hungry for more Monsterology paraphernalia are going to love collecting and trading these cards. I can just see my kids clamoring for collector tins and display binders. Since each monster is assigned specific attributes (for example, the Chimera is a Class 5 Earth Monster), kids will be able to use the cards to battle with their friends. The addition of Monster Trap cards will make things more interesting. 3Po and Jammy were delighted to see these cards because they're not featured in the Monsterology books at all. The book does mention monster traps but doesn't go into detail, so these cards are a great way to delve further into the Monsterology world. They'll be available for sale at major retailers, $1.99 for 4 cards. You didn't think I was getting all excited about mere trading cards, did you? I told you: this is a New kind of trading card game, and when I say New, I mean hi-tech touch-screen iPad-iPod 21st-century paradigm-shift game-changing call-the-papers kind of New. Nukotoys is also developing a Monsterology app that you'll be able to download, for free, onto your iPod Touch or iPad. Once you have the app, your kids can bring their Monsterology trading cards to life, simply by tapping them on the iPod Touch or iPad screen. That's right -- touch a pegasus card to the screen, and a pegasus will appear on the screen, prancing and flapping its wings and doing whatever it is that pegasi do. It's the most amazing thing I've ever seen. Kids will be able to dress, feed and play with their monsters. When they trade their physical cards, their virtual monsters will also change ownership. They get to collect badges and trophies for different achievements. Best of all, they will be able to play their virtual monsters against each other in a tactical, turn-based game. We got some time to play with Monsterology, but it was not nearly enough (the Nukotoys people literally had to pry the iPad out of my hands). However, Nukotoys will send me the final version of the app at the end of the month, so I can keep giving you sneak peeks and sharing my opinions. Having said that, no matter how much I try to describe it and rave about it, I won't do the app justice, so you can also check it out for yourself -- sign up to be a Beta Tester (maybe a better term would be Beta Monsterologist?) on the Nukotoys website. Ancient creatures meet 21st century technology? This is going to be awesome. And it's all coming to life in October 2011. Check out the other Parents@Play: Melinda Roberts from The Mommy Blog (@TheMommyBlog), Beth Blecherman from Techmamas (@techMama), Beth Avant from SDMOMfia (@SDMOMfia), Jason Avant from Dadcentric (@dadcentric), Anne Collier from Netfamilynews.org (@annecollier), Jeana Tahnk from jeanatahnk.com (@jeanatahnk), Shawn from BackpackingDad (@BackpackingDad). As a Nukotoys Parents @Play member, I will be receiving an iPad with the Monsterology app loaded on it, so I can share my opinions with Nukotoys and my blog readers. The views and opinions expressed here are my own. TIP #2: Trees can move and grow a lot after a tree house is built. When building a tree house, it’s important to accommodate for a TREE’S GROWTH. Keep platforms and supports 2-3" from branches and trunks and follow a building plan that suspends your tree house securely within the tree’s branches so that it can move independently of the tree. TIP #3: ROPE SWINGS AND TIRE SWINGS are a fun addition. Use a braided arborist rope ½" or greater in diameter and use a running bowline knot to hang your swing − your tree will thank you. TIP #4: THE BEST TREES TO USE FOR TREE HOUSES are Oaks, Maples, Beeches and Sycamores because they all have long lifetimes and strong branches to support a tree house. CLIF Kid and Living Tree are committed to making outdoor experiences fun and safe for kids, their families and the environment. If you are a tree house beginner, Living Tree recommends Peter Nelson’s book Home Tree Home: Principles of Treehouse Construction and other Tall Tales for safe plans that can help build the ultimate tree house. To learn more about CLIF Kid and Living Tree, visit www.ClifKid.com and www.LivingTreeOnline.com. Two lucky Bonggamom Finds winners will each receive a box of 1 dozen assorted CLIF Kid snacks (a combo of Original Zbar, Zbar Crispy and Zfruit (formerly Twisted Fruit)! Leave a comment on this post and tell me why your child would love a tree house in his back yard! This entry must be completed before extra entries qualify. 5) Leave a comment on this post and tell me your child's favorite CLIF Kid product. This giveaway ends at 11:59PM PST on August 15, 2011; I will draw two winners at random on August 16 and post their names after they confirm acceptance. Continental US residents only. For additional giveaway rules, click here. Good luck! Disclosure: I did not receive a sample or monetary compensation for this post. Program information is provided by CLIF Kid and is indicated in italics. The views and opinions expressed here are my own. The Pea is attending Galileo Summer Quest for the first time; she has been at camp for only four days, and already one of her favorite things about GSQ is Theme Day. They have five Special Days scheduled for the two-week camp session: Wacky Tacky Day, Water Day, Dress Like A Staffer Day, Galloween and Rep Your Major or Minor Day. 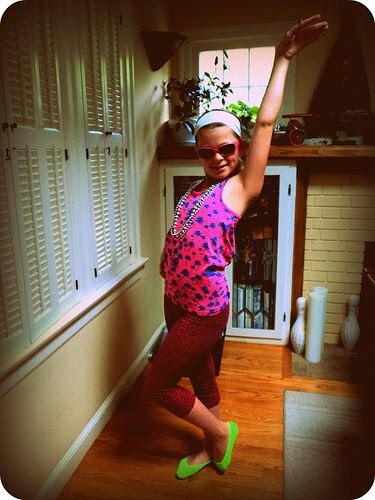 For Wacky Tacky Day, she went the Las Vegas Tourist route, and I have to say she really pulled the look off. Then again, her major (i.e. area of concentration for most of her activities and projects during the two weeks) is Fashion Design, so I guess all the sketching and sewing and learning about trends and fashion is rubbing off. Tomorrow she has to dress like her favorite camp counselor, which I thought was a pretty challenging task, but this GSQ Fashion Design Major has it all planned out. She's going to wear a blue shirt, because all Galileo staffers wear blue shirts with a Galileo logo (what a shame I gave away her old Camp Galileo camp shirts! ), and she's going to make a lanyard with the counselor's name on it. The Pea's favorite counselor also has blond hair, which she wears in a ponytail with a stripe of red haircolor sprayed on the back, which will be easy to imitate. The final touch will be track shorts like the counselor wears, and come tomorrow, no one will be able to tell them apart. Next week's Theme Days include Galloween, when campers show up in costume, and Rep your Major or Minor Day, when all campers in a certain Major or Minor wear the same color and put on a show to demonstrate to their proud parents what they've been learning for the past two weeks. 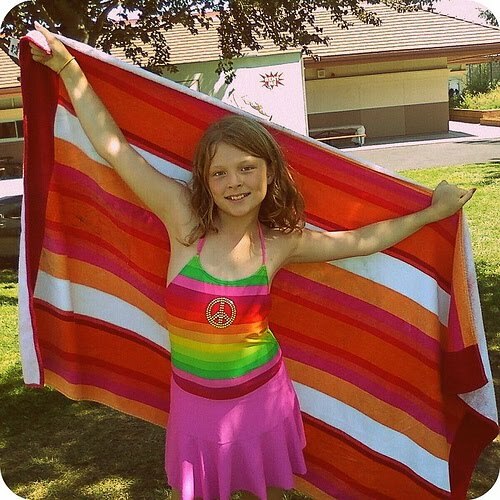 The Pea will be strutting down the Red Carpet, model a creation that she is designing (and will sew!) herself. Aside from Fashion Design, The Pea signed up for 2 Minor tracks -- Hip-Hop Dance and Jewelry Design -- so she'll also be doing a dance performance and a jewelry trunk show. These past four days have been busy, and it looks like the rest of her time at Galileo Summer Quest will be just as busy -- and thanks to their Theme Days, just as fun. I can't wait! 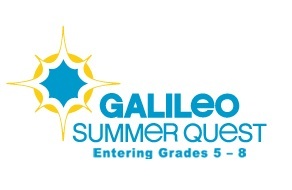 Disclosure: Disclosure: Galileo Learning provided my daughter with a complimentary session at Galileo Summer Quest to facilitate my posts. The views and opinions expressed here are my own. A couple of years ago I received some complimentary business cards from UPrinting.com, and I was very impressed at the quality and quick turnaround. In fact, if I've met you and given you a business card in the past two years, there's a very good chance that it's a UPrinting card! Aside from business cars, UPrinting.com also makes postcards, flyers, tickets, brochures, gift certificates, door hangers and more. Think only businesses need this stuff? Imagine your child's next birthday party -- I'll bet they'd love a custom birthday poster, or door hangers for party favors! UPrinting.com also makes greeting cards, labels, and more. Check them out! One lucky Bonggamom Finds reader will win an 18"x24" poster from UPrinting.com (semi gloss/high gloss, 1 business day turnaround). Visit UPrinting.com, then leave a comment on this post and tell me which UPrinting.com product you would most like to try. This entry must be completed before extra entries qualify. 1) Add my blog button to your sidebar (1 entry). This giveaway ends at 11:59PM PST on August 2, 2011; I will draw a winner at random on August 3 and post the winner's name after the winner confirms acceptance. Continental US residents over 18 years of age only. If you have won a prize from UPrinting in the past six months, you are not eligible to enter. For additional giveaway rules, click here. Good luck! Disclosure: This giveaway is sponsored by UPrinting, no monetary compensation was given and I will receive a poster for hosting. Check out UPrinting.com to see more of their poster, poster sizes and poster templates. The views and opinions expressed here are my own. With family on opposite sides of the world, we make lots of international calls. Lately we've been investigating alternatives to big phone companies, in an effort to reduce our phone bills. Here's one company that I've discovered -- Ooma. Ooma is a home phone device that allows you to call anywhere in the U.S. from your home essentially for free. You pay only applicable local taxes and fees and can even make international calls for next to nothing. The device is simply connected to your current high-speed Internet and your existing phone, and that's it. You're ready to start calling and experience Ooma's great voice quality. Now Ooma is giving everyone the chance to win free home phone service for life with a fun video contest: Ooma’s Free Home Phone Service for Life Video Contest. The contest ends midnight on July 31. Ooma will then select winners based on popularity, creativity and originality. Great news for your little engineers -- Chuggington, the popular CGI-animated TV series on Playhouse Disney will be releasing a new DVD on August 2: Chuggington: It's Training Time. “It’s Training Time!” features six episodes plus a three-minute bonus “Badge Quest” episode, Running On Time, which explores the importance of being punctual. Weaved throughout the fun-filled adventures are lessons to help hone preschoolers’ pro-social skills, such as the value of setting a good example (Training Time Harrison); cleanliness (Wilson Gets A Wash); following directions (Koko And The Tunnel); diversity (Watch Out Wilson); self-confidence (Wilson’s Smooth Move) and not jumping to conclusions (Eddie Finds Time). In Training Time Harrison, for example, Harrison is desperate to pull the royal carriage for the prince of Buffertonia, but he travels too fast, runs red lights and takes too many shortcuts. He eventually realizes that he’s setting a bad example for the trainees, who look up to him. In the end, Harrison studies properly, passes his test and is proud to pull the royal carriage through Chuggington! To celebrate, I've been given a copy of the new DVD to give away! One lucky Bonggamom Finds reader will receive a copy of Chuggington: It's Training Time. Leave a comment on this post and tell me your favorite Chuggington character. This entry must be completed before extra entries qualify. Disclosure: I did not receive a sample or monetary compensation for this post. Prize and product information are provided by Grand Communication; product info is indicated in italics. The views and opinions expressed here are my own. I certainly didn't expect to find specialty products like that at a place called Grocery Outlet! And all these items were priced below their regular price (for example, the Maranatha spread is $2.99, and they usually sell for about $5.99. I can vouch for that one, because we buy Maranatha all the time!). My interest was piqued sufficiently (take note, other PR firms!) for me to actually go out and shop at the nearest Grocery Outlet store. It's about the size of a small-ish supermarket or grocery store, and it has all the usual sections, including fresh fruits and veggies, dairy, juice, and frozen goods. Unlike most grocery stores, they don't have shelves; items remain in their sturdy cardboard packing boxes, which are stacked up to make aisles. It isn't like a warehouse club, either, because you don't have to buy in bulk. I found quite an assortment of big-name, mass-market brands, specialty brands and generic brands. I went around buying things as I normally do: Quaker oatmeal, Campbell's canned soup, Planter's nuts, fresh cantaloupe, Dole bagged salad. I also found our favorite Stonyfield Greek yogurt, Naked juice, Yves meatless ground "beef", and Jensen's Orchard veggie chips! The prices were clearly lower than you find at most supermarkets (i.e. the Stonyfield yogurt was 2 for $1, and they're usually $1.50 - $1.99), although you could probably get the same low prices at regular supermarkets when those products happen to go on sale. The store clientele also reflected the diversity: I saw a BMW and Mercedes-Benz in the parking lot, along with the beat-up old Chevys and generic Toyotas. Unfortunately, this Grocery Outlet is too far away from where I live for me to shop there regularly -- but it's great to know that shoppers on a budget have access to high-quality food at Grocery Outlet. And it has certainly laid waste to the myth that bargain hunters can't be food snobs as well! Disclosure: I received an assortment of products available at Grocery Outlet. The views and opinions expressed here are my own. Guess what, Pocoyo fans -- there's a new Pocoyo DVD coming out soon! Dance Pocoyo Dance is Pocoyo's latest DVD, and it's hitting stores on August 15. The Dance Pocoyo Dance! DVD, based on the Pocoyo animated television series, will encourage kids to get up and dance, jump and have fun for hours. The music provides high-energy participation, and Pocoyo and his animal friends, Elly the elephant, Pato the duck, and Loula the dog, add to the excitement. It’s a good workout for Mom and Dad, too. Get a free copy of Dance Pocoyo Dance DVD from Langers Juice! Beginning August 1 through August 31, parents can receive an all-new Pocoyo DVD – Dance Pocoyo Dance!–with the purchase of 10 Langers Juices (plus $1.99 shipping and handling), while supplies last. To celebrate the release of Dance Pocoyo Dance and Pocoyo's new partnership with Langers juice, Pocoyo is giving away a copy of the Dance Pocoyo Dance DVD to one lucky Bonggamom Finds reader! Leave a comment on this post and share your kids' favorite kind of 100% juice. This entry must be completed before extra entries qualify. This giveaway ends at 11:59PM PST on August 15, 2011; I will draw a winner at random on August 16 and post the winner's name after the winner confirms acceptance. Continental US residents only. For additional giveaway rules, click here. Good luck! Disclosure: I did not receive a sample or monetary compensation for this post. Product and promo information is provided by the featured company/product and is indicated in italics. The views and opinions expressed here are my own. When I worked in downtown San Francisco, hardly a week would go by without my dropping in to the Ross Dress For Less store on Market Street. It was just 3 blocks from where I worked, and since the Ross branch on University Avenue in Palo Alto closed about a decade ago, I've had to drive to neighboring Mountain View to get my Ross fix. The Ross San Francisco store was huge, crazy, and the perfect way to indulge in some affordable retail therapy! A couple of weeks ago I set foot in the Market Street Ross for the first time in almost 8 years, and boy has it changed! It still has four floors of awesome bargains, but it has been renovated, and it feels really nice and new. 1) More efficient checkout. There are tons of checkout stands, each with a light that flashes to alert the next shopper in line to pay. A video monitor also indicates which checkout stand has just freed up, and when I was there, a greeter stood at the front of the line to make sure each shopper knew where to go. 2) Check out the cool mural in the photo above! Love that San Francisco cityscape! 3) The floors seem to be better organized, so you can find what you want more easily. 4) This Ross has the biggest stock of large-sized shoes that I have ever seen at any Ross store, ever! Normally the 10's, 11's and 12's are bunched up in a tiny little corner, but there is actually quite a decent selection at this store. Maybe it's because the women in San Francisco have bigger feet than in the Peninsula, or because there are more cross-dressers in San Francisco, but this is one BigFoot who is not complaining! 5) It goes without saying that the prices at Ross are fantastic. I was given a $50 giftcard to shop at the Ross San Francisco store, and I walked away with a pair of name-brand flip-flops, a pair of name-brand yoga pants, a sports bra, and a bamboo chopping board set! Try getting all of that for fifty bucks at any other place - ha. I don't need to go to any of the chi-chi shops at Union Square, because I can get real quality stuff just a short walk away at the Market Street Ross! Disclosure:Ross invited me and other bloggers to the renovated Ross Dress for Less in San Francisco. Each blogger received a Ross Dress For Less gift card to use at the event. The views and opinions expressed here are my own. RIO, the animated movie from the creators of Ice Age, is coming out on Blu-ray and DVD on August 2 -- and I'm giving a DVD copy away here! As summer heats up, spread your wings and celebrate with the funniest birds in town! The all-new comedy-adventure RIO comes to Blu-ray and DVD from Twentieth Century Fox Home Entertainment. RIO brings together vivid characters and colorful backdrops amidst energizing Latin and contemporary tunes, creating the ultimate family-friendly music and dance experience for audiences of all ages. In addition to more than one hour of special bonus features and materials, consumers will have access to all-new exclusive levels of the smash video game hit Angry Birds Rio® that showcase your favorite characters from the film! Captured as a young bird from the wild, Blu (Jesse Eisenberg, The Social Network) is a domesticated Spix Macaw living thousands of miles away from his homeland, Brazil. When his human owner Linda (Leslie Mann, 17 Again) discovers that he is the last male of his kind, they head south to Rio de Janeiro to meet the only other female. But it's far from love at first sight between the socially-awkward, flight-challenged Blu and the fiercely independent, high-flying female, Jewel (Anne Hathaway, The Princess Diaries). 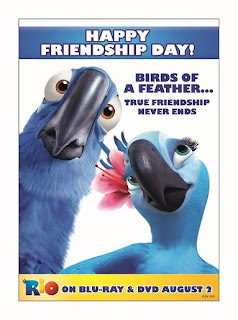 Shortly after Blu's arrival, the two rare birds are captured by greedy animal smugglers and find themselves lost in the Brazilian rainforest. Unexpectedly thrown together, they embark on a hilarious and clumsy adventure where they learn about friendship, love, courage and spreading one's wings to fly. RIO will be available in a 3-Disc Party Edition, featuring the Blu-ray, DVD, and Digital Copy, as well as in a 2-Disc DVD Party Edition. It is available in the U.S. and Canada. Leave a comment on this post and tell me your favorite character in the movie. This entry must be completed before extra entries qualify. This giveaway ends at 11:59PM PST on August 10, 2011; I will draw a winner at random on August 11 and post the winner's name after the winner confirms acceptance. For additional giveaway rules, click here. Good luck! Disclosure: I did not receive a sample or monetary compensation for this post. Movie information is provided by Fox Thinkjam and is indicated in italics. The views and opinions expressed here are my own. I first met Stephanie O'Dea at a blog event in June, and my first impression of her was, hippie chick. She was wearing a long peasant skirt and sandals. Her hair was long and flowing, and she charmed everyone with her infectious laugh and bright smile. But make no mistake, Stephanie is no ditz. She's the total opposite of scatterbrained; she's actually one of the most totally together women I've ever met. She's the author of the popular blog, A Year of Slow Cooking, and the New York Times bestselling author of the Make It Fast, Cook It Slow series of cookbooks, and she has appeared on The Rachel Ray Show, Good Morning America, and various publications like Real Simple and the New York Post. She turned her love of crockpots into an empire with strength of character, hard work and determination. So I was delighted and honored to be able to review and give away her newest book, Totally Together: Shortcuts to an Organized Life, which is coming out on August 2. It's a guide, calendar, notebook, checklist and planner to help busy people find some order in their busy lives. Just in time for the back to school rush, TOTALLY TOGETHER (Berkley Trade Paperback; August 2, 2011; $15.00) is the indispensable guide to organizing a busy household so anyone can have a tidy and tranquil home in just minutes a day. New York Times bestselling author and popular mommy blogger Stephanie O’Dea provides a practical, how-to guide in a weekly calendar format to make home organization and time management a snap. The thought of company and entertaining can send the calmest of women into a tailspin. The cleaning, preparation and organization that precede a family party or overnight guests is enough to avoid the issue altogether. However, Stephanie says that her home is always company ready within 30 minutes and she can help you whip your home into shape as well! Stephanie has developed the “clean less, play more” method, which allows you to fly through all the chores and minutiae in minutes a day so you can move on to what you really want to do: spend time with family and enjoy living life. Using a weekly organizational planner format, Stephanie spells out exactly what chores are essential and how they should be tackled to maximize time and minimize effort including: · Seven daily chores that anyone in the family can do in just minutes · Yearly, seasonally, monthly, and weekly chores divided into bite-sized chunks · Household tips and cleaning shortcuts · Guide for setting up meal plans · Fun, fast recipes · Reproducible grocery list with check boxes · An action plan for keeping the entire family organized · And much more Stephanie’s book is ideal for both working and stay at home moms and even those with no children who want an organized home but don’t want or have the time to spend hours cleaning. I know what you're thinking: How does one make the jump from cookbooks to planners? But when you think of it, Stephanie's cookbooks are all about easy meals that save families time and effort, without resorting to fast food, takeouts or processed food. Stephanie is all about streamlining and idiot-proofing day-to-day tasks so that you lead a quality life and free up more time for the things that matter. * It's small enough to fit in most women's purses. * The weekly planner starts in September, which coincides with the beginning of the school, so moms can keep the same planner in their purse for the whole schoolyear. * There's always something new and fresh to read in each week of the planner: a recipe, a craft, a quote, a tip, a reminder. * A recurrent theme throughout the book is to Remember the WoMom -- the woman behind the mom. The book encourages moms to take care of themselves: do breast self-exams, go out with friends, exercise, say NO, ask for help, do something nice for yourself. Taking care of yourself is one of my mantras for 2011, and rediscovering the woman behind the mom is one of the main reasons I started my blog, Finding Bonggamom, so I couldn't agree more! As planners go, I love Totally Together, and I highly recommend it for moms who use planners. Unfortunately, I'm not really a planner kind of girl! I prefer to keep my calendar and task list online, so Totally Together is not in my purse; it sits on my bookshelf as more of a reference guide. What we need now is a Totally Together app for the iPod, iPad and Android that can sync up with a Google calendar! Stephanie, there's your next project! One lucky Bonggamom Finds reader will receive a copy of Stephanie O'Dea's book, Totally Together: Shortcuts to an Organized Life. Leave a comment on this post and tell me your biggest organizational challenge. This entry must be completed before extra entries qualify. This giveaway ends at 11:59PM PST on August 7, 2011; I will draw a winner at random on August 8 and post the winner's name after the winner confirms acceptance. Continental US and Canada residents only. For additional giveaway rules, click here. Good luck! Disclosure: I received a review copy of the book to facilitate my review, but have not been paid to review the product or give my opinions. Book synopsis is provided by the Penguin Group and is indicated in italics. The views and opinions expressed here are my own. Master Lock® has hired a new specialist on student life to help students safely and securely navigate this school year in style. 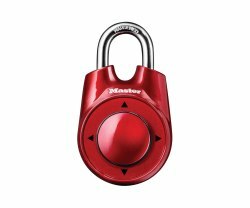 The Master Mind, a suave and funny college grad, is staring in a humorous online video series on in which he, along with his clever Little Sister, are setting out to answer students’ most frequent, awkward and perplexing questions on www.facebook.com/masterlock. More information about the back-to-school video series and sweepstakes, as well as the newest and coolest Master Lock back-to-school accessories, can be found at http://mwne.ws/pELmnK. 1) Buy all your school supplies and books before school starts! 3) Start transitioning to your school schedule -- set your alarm clock back 5 minutes every couple of days and you'll get back to waking up at 7:00 AM in no time. 4) If it's your child's first time at the school, visit the school before classes start so he or she can get familiar with the layout. 5) Help your child look forward to the schoolyear by throwing a back-to-school party for him and his school friends. 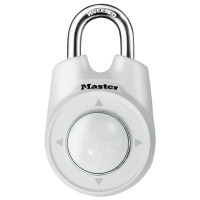 Disclosure: By posting this, I am eligible to receive a prize pack from MasterLock and the Mom Bloggers Club. The views and opinions expressed here are my own. Whether it's a 2-hour car drive or a 14-hour flight, we always take along snacks and activities to keep kids energized and occupied. Every parent knows it's the secret to a bicker-free, "Are We There Yet"-free trip! When they were kids we packed little toys or play-doh and board books, and now that they're bigger they like video games, books, and origami paper. Fortunately, none of my kids get carsick, so they can read anywhere. And when they're on international flights, they love it when airlines hand out activity kits, no matter how old they are! Those airplane activity kits are a real lifesaver, but they seem to be harder and harder to find as airlines cut back on little perks, so it's really nice to hear that JetBlue flights are now offering fun Reading Activity Kits this summer. It's all part of their Soar With Reading partnership with PBS Kids, which encourages kids to keep reading all summer. I think any effort to get kids reading should be applauded, so Kudos to JetBlue and PBS KIDS for doing this! As families pack bags for road trips and rides in the sky, JetBlue is encouraging kids to pack books for their cross country adventures or even for their trips to the backyard. This week JetBlue is launching “Soar with Reading” a reading program with partner PBS KIDS. The program aims to keep children reading wherever they go this summer – with a combination of in-flight and online literacy resources, community reading events and a partnership with First Book, a nonprofit organization that provides new books to children in need. * At the center of the program is the newly launched SoarwithReading.com, where parents can download a free reading activity kit, create a summer reading list and log their children’s reading minutes, among other activities. * For every reader who registers on SoarwithReading.com, JetBlue will make a book donation to a child through First Book, up to 10,000 books. * This summer, Jet Blue is also sending crewmembers out to volunteer at kid-friendly events at local libraries all across the country. These global guides will read books to children, share stories about their job and their exciting travel adventures. * Child passengers will also receive activity kits on JetBlue flights as well! * Additionally, the campaign will support public libraries. At SoarwithReading.com families can vote for their favorite library in the Soar with Reading Sweepstakes. The winning library will receive $10,000 worth of children’s books courtesy of Jet Blue and Random House Children’s Books. And if you enter the winning library, you will have a chance to win a trip to Atlantis! JetBlue sent us one of their activity kits, and it's definitely one of the better airline activity kits we've tried! It has a Magic Treehouse book, a Steve Songs CD, an activity book, and a little paper cutout of Hooper, the cute PBS guinea pig, all packed into a lightweight travel backpack. I'd say it's perfect for kids ages 4-9, although even younger kids can scribble on the activity book and listen to the cd. One lucky Bonggamom Finds reader will receive a JetBlue activity kit, featuring a JetBlue travel backpack, books and other fun JetBlue and PBS KIDS extras (see my description above)! Leave a comment on this post and tell me your favorite childhood book. This entry must be completed before extra entries qualify. RT @bonggafinds: Sign up for JetBlue & PBS KIDS' http://SoarWithReading.com program & JetBlue will donate a book to a child via First Book. This giveaway ends at 11:59PM PST on August 7, 2011; I will draw a winner at random on August 8 and post the winner's name after the winner confirms acceptance. Continental US residents only. For additional giveaway rules, click here. Good luck! Disclosure: I received a JetBlue activity kit as a thank-you for posting about the program and hosting the giveaway. Prize is provided by JetBlue. Program information is provided by JetBlue and is indicated in italics. The views and opinions expressed here are my own. This past year, music education has entered our lives in a big way. 3Po and Jammy joined their school choir and have performed at several school concerts and at local senior centers. They're even singing the national anthem at a San Francisco Giants baseball game next month! They also started piano lessons and they practice every day, even though they're not taking lessons in the summertime. The Pea also started recorder lessons in school and she'll be moving on to violin or flute lessons when she enters 5th grade in the fall. Our home is full of the sounds of our kids making sweet music, and for that I have our school's music program to thank! I know our school is lucky to be able to keep a music program, twice a week (plus the school choir) for students in every grade -- and I know there are many schools and districts that aren't so lucky. I firmly believe that music education is just as important as reading and math -- in fact a music education strengthens students' analytic and math skills! -- so I'm also grateful to organizations like VH1's Save The Music Foundation for their efforts to restore instrumental music education in America's public schools. I'm also happy to announce that one of my favorite brands, Energizer, is partnering with the VH1 Save The Music Foundation, and there are tons of easy ways for you to get involved! You can find out more at http://www.nowthatspositivenergy.com/blog. In celebration of Energizer’s partnership with the VH1 Save The Music Foundation and to help power your playlist, Energizer is offering a $10 iTunes Gift Card for one lucky Bonggamom Finds winner. Leave a comment on this post and tell me why you think music education in public schools is a worthy cause. This entry must be completed before extra entries qualify. RT @bonggafinds: Buy 3 participating Energizer products and redeem the codes for a $10 iTunes card at www.nowthatspositivenergy.com/music ! This giveaway ends at 11:59PM PST on August 5, 2010; I will draw a winner at random on August 6 and post the winner's name after the winner confirms acceptance. US addresses only. For additional giveaway rules, click here. Good luck! Disclosure: I will be receiving an iTunes gift card from Energizer as a thank-you for blogging about this program. Program information is provided by Energizer and is clearly indicated as such. Thanks to Energizer for providing and shipping the giveaway prize. The views and opinions expressed here are my own. What true blue Thomas the Tank fan hasn't dreamt of riding the rails on the Island of Sodor? Now little engineers will get their chance, because Thomas is chugging into a train station near you! Families can ride on a real (okay, a 15-ton replica) Thomas at a Day Out With Thomas event. Pulling out of the station for its 16th consecutive ride on the rails, the Day Out With Thomas: Leader of the Track Tour 2011 will visit more than 45 cities in the United States and Canada . Day Out With Thomas is the only place for families to take a ride with a 15-ton replica of everybody’s favorite No. 1 engine, Thomas the Tank Engine, and enjoy Thomas-themed activities at the Imagination Station, including stamps, temporary tattoos and hands-on arts and crafts. Each year the tour grows, traveling to new destinations, adding new activities and welcoming new visitors. You can search to see which cities Thomas is visiting and purchase tickets on Ticketweb. Thomas is visiting over 45 cities through mid-November. We've been invited to attend a Day Out With Thomas next week, and even though my boys are sophisticated 7 year olds, they can't wait! The one nearest us will be held at the Roaring Camp Railroad in Felton, CA, on July 29, 30 and 31. We've ridden the steam trains at Roaring Camp Railroad before, and there is honestly no better way to spend the day than chugging through a cool, shady redwood forest on a train. Grownups love it because the scenery is so beautiful, and kids love it because, well, it's a steam train. I can only imagine how much more exciting it will be for kids when it's not just any old steam train they're riding, but the one and only Thomas! Stay tuned for my Day Out With Thomas post where I'll tell you all about it! If you can't make it to Day Out with Thomas event, your child can still enjoy Thomas the Tank Engine this summer with the new Thomas & Friends app for ipad, iphone, and ipod touch. Thomas & Friends™: Hero of the Rails, brings Thomas and his engine friends to life in an interactive app filled with animation, CGI video, painting activities, puzzles and games. It's based on Thomas' animated feature-length movie Hero of the Rails, and it's available for a limited time for $0.99 in the iTunes app Store at www.itunes.com/appstore/. Disclosure: I am receiving 4 complimentary tickets to a Day Out With Thomas event, but have not been paid to review the product or give my opinions. Event information is provided by DKC PR and is indicated in italics. The views and opinions expressed here are my own. I first found out about American Girl about 4 years ago, and despite my initial negative reaction, American Girl has become one of my favorite (and my daughter's favorite!) doll brands because of their wholesome image, educational value and quality products. Really, my biggest objection was, and has always been, the high cost. We've been able to manage it by shopping the sales on AmericanGirl.com, buying used, and expanding our horizons beyond AG-branded products. One great website for American Girl outfits and furniture is My 18 Inch Doll, which offers affordable solutions for dressing American Girl and other 18 inch dolls. They recently sent us their Denim & Dots 4-piece outfit so we could see the quality and fit for ourselves. My 18 Inch Doll designs and offers exclusive clothing and furniture perfectly sized to fit American Girl Dolls and other 18 inch dolls. If you're looking for adorable doll clothing; doll sized beds or sofas or functional storage like our doll trunk or doll tote bag, you have come to the right place! My daughter LOVES the Denim & Dots outfit! It comes with a denim jacket, a yellow tee, and a pleated skirt and hat in the cutest polka-dot print ever. It's chic and sassy, and it has become The Pea's favorite outfit for her American Girl dolls. The nice thing about this outfit is that you can easily mix and match it with other doll clothing. The denim jacket, in particular, is really versatile, and goes really well with other clothes in The Pea's collection. The yellow tee is also really easy to pair, so the whole outfit really goes a long way. It's not surprising that the Denim & Dots outfit is My 18 Inch Doll's most popular outfit! That being said, they do have quite a few other cute (mostly vintage-style) clothing outfits. I really like the black overcoat and the old-fashioned school jumper -- and if your daughter wants to reenact scenes from her favorite books, they even have outfits inspired by Anne of Green Gables and Little House on the Prairie. On the practical side, the outfit we received was very well made, and fits the American Girl dolls very well. What's more, all the outfits on their site are on sale, and they offer free shipping! The Pea was not interested in the period clothing, and the choices for modern clothing are slim. Also, although the site bills themselves as an affordable solution for dressing American Girl and other 18-inch dolls, a quick price comparison shows that regular price for most outfits on My18InchDoll.com are between $24.99 and $29.99, which is the same price range for most outfits on AmericanGirl.com (some outfits are $30). True, their sale price is cheaper ($14.99 to $18.99), and all of the outfits seem to be on sale -- so why not make the regular price lower and just put the higher price there as a comparison? The quality of My 18 Inch Doll clothing rivals that of American Girl branded clothing -- and the price is certainly right! Disclosure: I received a sample outfit to facilitate my review, but have not been paid to review the product or give my opinions. Company description was taken from the My18InchDoll.com website and is indicated in italics. The views and opinions expressed here are my own. 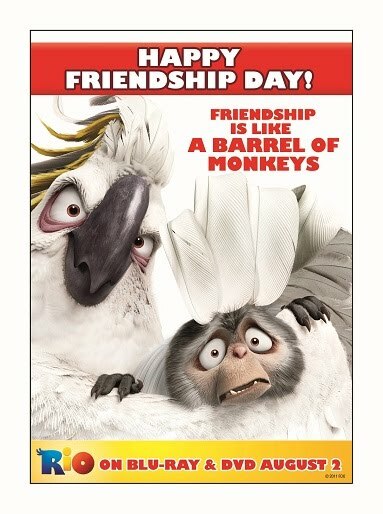 The United Nations has declared July 30th as the official annual International Day of Friendship. U.N. Resolution A/65/L.72 calls friendship "a noble and valuable sentiment in the lives of human beings," and notes that friendship contributes to "the promotion of dialogue among civilizations, solidarity, mutual understanding and reconciliation." 1) Braid a friendship bracelet. 2) Write on your friends' Facebook walls and say "Hi". 3) Have lunch with a friend. 3) Be a friend to someone you don't know and practice a random act of kindness -- pay for someone's bridge toll, or buy the next person in line a cup of coffee. I'll be giving away a copy of the upcoming RIO dvd, so stay tuned! Disclosure: I did not receive a sample or monetary compensation for this post. DVD information is provided by the featured company/product and is indicated in italics. The views and opinions expressed here are my own. Who doesn't love rice crispy squares? The sweetness and crunch are such a classic childhood treat -- but let's face it, they're kind of nutritionally void. As parents, we want every bite that goes into our kids' mouths to do them as much good as possible, but in order to even reach our kids' mouth, it has to be something he wants to eat! That's not going to be a problem with new Zbar Crispy from CLIF Kid. It's an rice crispy snack made with organic ingredients and nutrients for active, growing kids. Our family were given some samples to try, and they're a crispy, crunchy hit. New Zbar Crispy, an organic rice crispy snack. Comes in 3 flavors -- Chocolate, Chocolate Chip and Peanut Butter. Zbar Crispy also offers more calcium, iron, zinc, and vitamin D than most all-family snack bars. These nutrients are essential for kids' growth but tend to often be missing in kids' meals and snacks. All natural: no HFCS, hydrogenated oils, artificial flavors, colors or preservatives, no trans fats. 8g of whole grains. Yum! I'm not surprised that everyone in the family loves these new Zbar Crispies. The Chocolate was the all-around favorite; not only do you get yummy chocolate flavor in every bite, you also get chocolate chunks scattered throughout the bar for twice the yumminess! Neither Alfie nor I liked the Peanut Butter flavor much; I didn't see any peanuts in the bar, just peanut butter chips that didn't really taste like peanut butter, more like butterscotch. But the Peanut Butter was actually the kids' favorite flavor! They liked it much more than the Chocolate Chip Flavor (which was Alfie's and my second favorite), so maybe the sweetness appeals a lot more to kids than it does to adults. I guess I have to bow to the kids' opinion because these are Clif *Kid* bars, after all (although I actually prefer them to regular Clif bars because the servings are smaller). What a great, yummy, healthy option from Clif Kid to add to my kids' lunch box and snack time stash! One lucky Bonggamom Finds reader will receive a box with one dozen Zbar Crispy snacks from CLIF Kid (4 of each flavor). Leave a comment on this post and tell me which flavor of CLIF Kid Zbar Crispy you or your child would like to try the most. This entry must be completed before extra entries qualify. This giveaway ends at 11:59PM PST on July 30, 2011; I will draw a winner at random on July 31 and post the winner's name after the winner confirms acceptance. Continental US residents only. For additional giveaway rules, click here. Good luck!